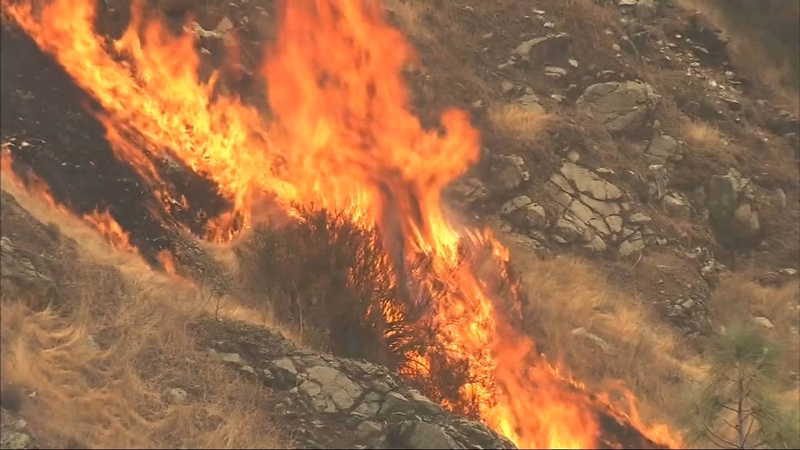 SACRAMENTO (KFSN) -- California Governor Jerry Brown issued an emergency proclamation Thursday afternoon for Mariposa County due to the Ferguson Fire. WHEREAS under the provisions of Government Code section 8571, I find that strict compliance with the various statutes and regulations specified in this order would prevent, hinder, or delay the mitigation of the effects of the Ferguson Fire. 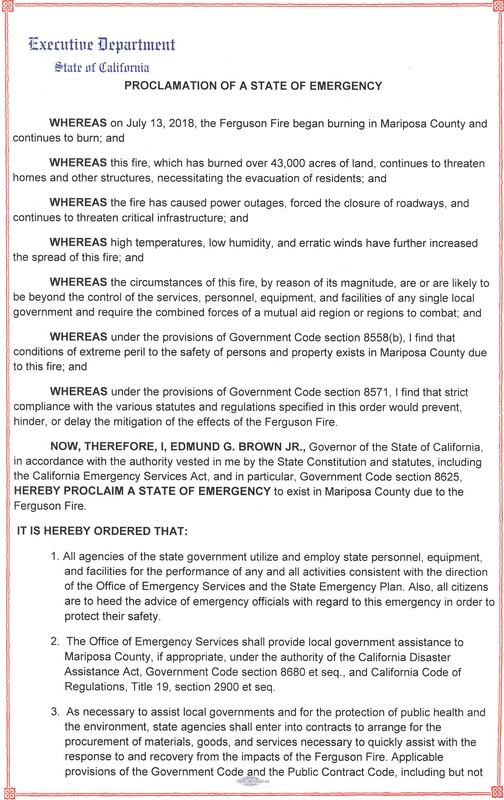 NOW, THEREFORE, I, EDMUND G. BROWN JR., Governor of the State of California, in accordance with the authority vested in me by the State Constitution and statutes, including the California Emergency Services Act, and in particular, Government Code section 8625, HEREBY PROCLAIM A STATE OF EMERGENCY to exist in Mariposa County due to the Ferguson Fire. The Office of Emergency Services shall provide local government assistance to Mariposa County, if appropriate, under the authority of the California Disaster Assistance Act, Government Code section 8680 et seq., and California Code of Regulations, Title 19, section 2900 et seq. As necessary to assist local governments and for the protection of public health and the environment, state agencies shall enter into contracts to arrange for the procurement of materials, goods, and services necessary to quickly assist with the response to and recovery from the impacts of the Ferguson Fire. Applicable provisions of the Government Code and the Public Contract Code, including but not limited to travel, advertising, and competitive bidding requirements are suspended to the extent necessary to address the effects of the Ferguson Fire. The provisions of Unemployment Insurance Code section 1253 imposing a one-week waiting period for unemployment insurance applicants are suspended as to all applicants who are unemployed as a direct result of the Ferguson Fire, who applied for unemployment insurance benefits during the time period beginning July 13, 2018, and ending on the close of business on January 13, 2019, and who are otherwise eligible for unemployment insurance benefits. Vehicle Code sections 9265(a), 9867, 14901, 14902, and 15255.2, requiring the imposition of fees, are suspended with regard to any request for replacement of a driver's identification card, vehicle registration certificate, or certificate of title, by any individual who lost such records as a result of the Ferguson Fire. Such records shall be replaced without charge. 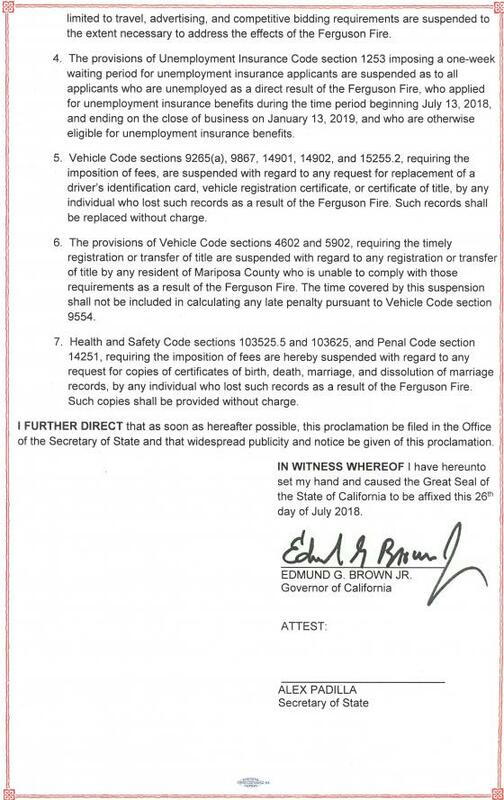 The provisions of Vehicle Code sections 4602 and 5902, requiring the timely registration or transfer of title are suspended with regard to any registration or transfer of title by any resident of Mariposa County who is unable to comply with those requirements as a result of the Ferguson Fire. The time covered by this suspension shall not be included in calculating any late penalty pursuant to Vehicle Code section 9554. Health and Safety Code sections 103525.5 and 103625, and Penal Code section 14251, requiring the imposition of fees are hereby suspended with regard to any request for copies of certificates of birth, death, marriage, and dissolution of marriage records, by any individual who lost such records as a result of the Ferguson Fire. Such copies shall be provided without charge. /s/ EDMUND G. BROWN JR.